Still just very recently I was in touch with Katie from Viva Lewes Magazine after she asked me if I'd like to do their photography section The Way We Work for the July issue. The topic was photographing portraits of beekeepers of Lewes and I was so excited as it felt like a perfect match for me. Soon after I embarked on the little adventures of visiting the apiaries, getting to know these four lovely beekeepers and getting very close to the bees. We've discussed safety and I decided that I was not worried about the bees and was going to brave photographing without wearing a beekeeping suit myself (it's completely safe and sound, especially if you wear appropriate outfits and remain calm) . So every time as I watched Hilary, John, Ian or Norman put on their suits, I stood there watching the bees from the closest distance I've ever seen them. Growing up I spent a lot of time in the countryside and close to beehives, so whilst bees were one of the millions of things I was afraid of, I've been stung a few times and realising it was not a great deal helped me get over the intimidation. Yet being so close to them was quite exciting! To tell the truth, I found myself very relaxed and reassured about it. Most of the hives were very calm and the beekeepers reassured me saying it was all perfectly safe. When I went to meet Ian he warned me immediately that one of his hives was particularly grumpy that morning, so we didn't take any chances and I photographed him in the foliage and the road by the apiary. 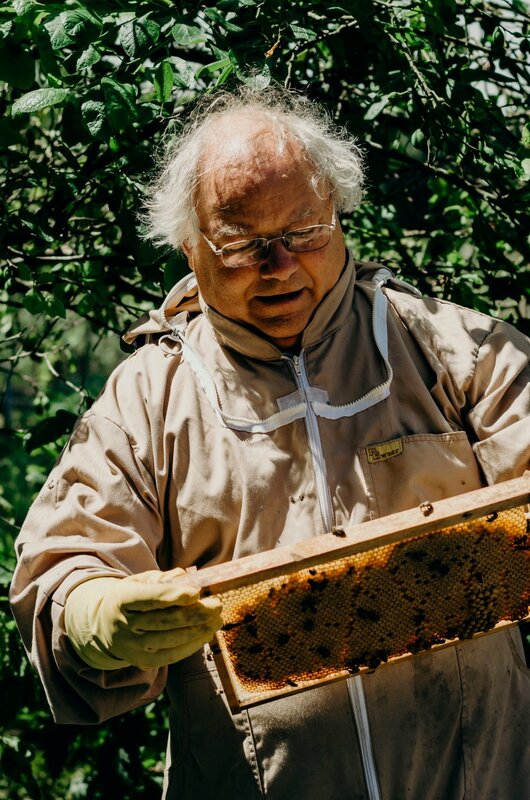 I learned a lot of new things about beekeeping, but most importantly I had the chance to meet and speak to people who love what they do and have such a beautiful dedication to their bees and their craft. Due to certain industrial farming practices and environmental issues, bee populations have been increasingly experiencing very hard times. And yet they play such a pivotal role in the food system. Let this be a reminder of the importance of bees to our livelihood and our environment & give a little bit of time in your mind and your life to these amazing little creatures. Whether a little bit of appreciation, an active effort to help the bee populations, a reason to buy your honey locally or a thank you to your local beekeepers - give them a little bit of love. As they give so much to us. And thank you, dear beekeepers, you all do such important work and are an inspiration to us all! Thanks also to Viva Lewes for the chance to do this. Check out Viva Lewes Magazine here. I asked each of the beekeepers one question: what is the most interesting way you have used honey? Quick look of the layout in the magazine. Lots more photos below!